In the 1870s, the development of housing for working class single men was an issue that many thought needed to be addressed. To do this a group of philanthropically minded men decided to form a limited liability company with shareholders to address the matter. This charity was different to most and was not, strictly speaking, a charity as those who benefited had to pay for the benefit they received and the shareholders were to receive a dividend from their investment. The project was called the Model Lodging House Company of Sydney (Limited) (MLHL). There was already a Model Lodging House in Melbourne which commenced in 1871, but it proved more difficult to commence one in Sydney. The purpose of the company was ‘to furnish in Sydney accommodation for the poor of the hard-working classes, who have no homes of their own, a shelter by night, both healthful and decent, at a cost which will make the institution self-supporting, and which may in the course of years pay a moderate dividend to the shareholders.’ The principle of the MLH was that the working man did not need charity in the narrow sense of the term and so they were determined to make the MLH pay. They did not intend to disparage the broad principle of charity, but they wished to avoid the ‘eleemosynary [Latin for charity] element’ in an institution that should stand alone. First efforts to commence a MLHL were made in 1874 by Alfred Stephen but were unsuccessful. Henry Burton Bradley (1815-1894), Secretary of the Health Society of New South Wales (HSNSW) again raised the matter in 1876 and under the banner of the HSNSW continued to pursue the matter approaching Josiah Mullens to enlist his support for such a venture. In August of 1877, the HSNSW agreed to attempt to float a company in order to raise the capital to build a lodging house initially to accommodate 100 with FH Reuss (Snr) giving his services as an architect to design the building. In February 1878, Bradley, ever positive and hopeful, was reported as saying that commencement of the building was to soon begin. 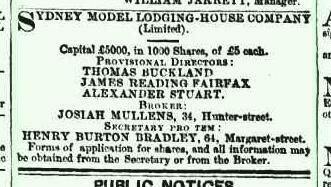 The company was formed with a capital of £5,000, 1000 shares of £5 each, its directors being Thomas Buckland, James Reading Fairfax, Alexander Stuart with Josiah Mullens the broker, Henry Burton Bradley the Secretary and John Sidney was the collector. It was proposed to purchase a suitable site, erect a building to nightly accommodate a maximum of 200 lodgers, to provide beds, bedding, baths and toilets and it was viewed as a non-pauperising enterprise as those using it would pay the accommodate cost of nine-pence per night. By April 1878, 579 shares had been taken up but not yet enough to commence. Then, in August of that year, the articles of association were agreed to and a call of £2 and 10 shillings on shareholders was issued in order to purchase a site on the western side Kent Street nearly opposite Charlotte Place. The block had a frontage to Kent Street of 107 feet, magnificent views of the harbour and sold in July 1878 at auction for what was regarded as the low price of £22 per foot, which presumably meant a total price of £2,354. WW Wardell was now the supervising architect and after a delay of a year, in order to avoid inflated prices due to the International Exhibition, the tender of G Crispo & Son for £8,000 was accepted and the building was commenced by mid-1880. Construction did not go as smoothly as desired for, as excavations proceeded for the foundations, it was discovered that the site had been an old quarry and had been filled with rubbish. The removal of the rubbish and the need for an extra basement floor increased the cost by an additional £680 and the total final cost of the building, plus outfitting for 200 residents, was in the vicinity of £15,000. With construction proceeding towards completion in 1881 John Sidney, the collector, was authorised by the board of directors to collect the outstanding amounts of £2 and 5 shillings on each share of the company. By May 1882, Burton was able to announce MLH would open in a few days’ time for the admission of single men and it was finally opened a month later on June 19, 1882 by its leading advocate Bradley Burton. The board of directors at this time were Louis Phillips (Chairman), William Beaumont, Thomas Buckland, E Ross Fairfax, James S Harrison and Henry Burton Bradley (Secretary). 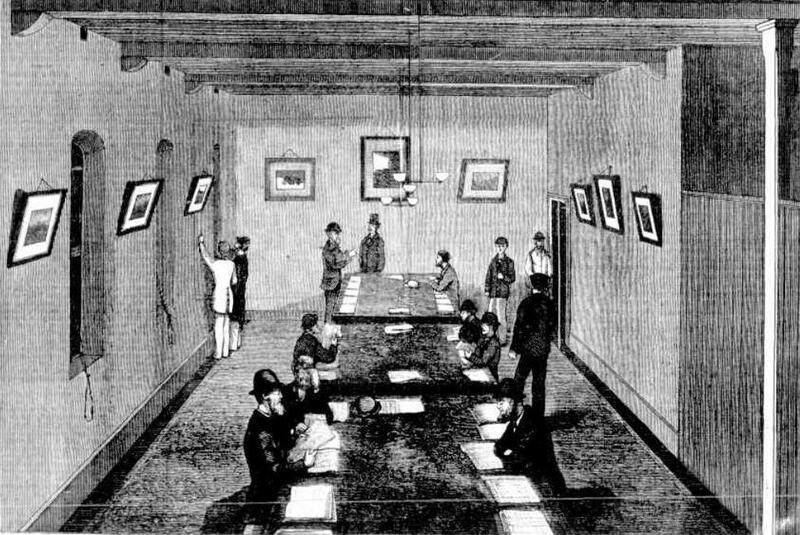 The basement contains a large room about 45 x feet by 32 feet, to be used as a sitting-room by the lodgers, and in which they can make their tea, coffee, &c. There are also two rooms which can be used as separate or private rooms, a lavatory, and an ante-space for hanging wet clothes, &c. In an airing yard on the south side of the building, and on a level with the basement, the bath-house is built, and a shed for smoking, &c. Another portion of this yard will be devoted to the laundry, purifying-house, &c. The ground floor, on the level of Kent-street, contains the superintendent’s room, a board-room, an attendants’ room, a reading-room for the men, and sleeping accommodation for about 20 men. The remaining three floors give sleeping accommodation for 80 lodgers on each floor. The external dimensions of the building are 86 by 60 feet, with a tank tower at the west end, in which is a lavatory at the level of each of the three upper floors. The height of the building in Kent-street is 73 feet from the pavement to the ridge of the roof. All the rooms are 16 feet high, and the walls are pierced with windows on all sides, affording excellent ventilation and plenty of light. The company own a strip of land on each side of the building, and are thus enabled to prevent any encroachment likely to shut out air and light. On the north side there is a strip 10 feet in width, and this adjoins a 20 foot road leading to Messrs. Frazer and Co.’s stores, so that there will be an open space of 30 feet there. 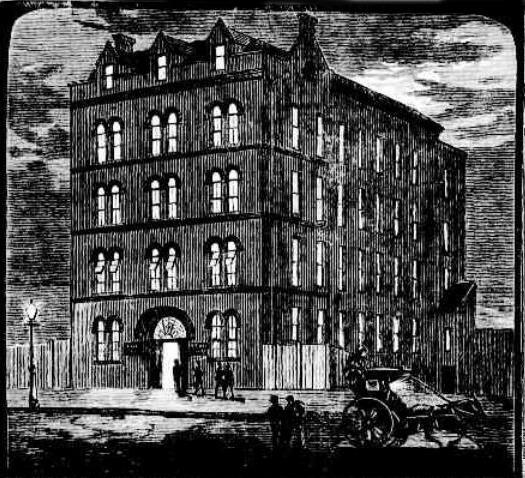 On the southern side there is a spare strip of land 28 feet wide in one part, and 48 feet wide in another, and it is not improbable that this will someday be occupied by a temperance eating-house for the benefit of the frequenters of the Model Lodging-House. Initially, John Murray was appointed resident manager, but he died less than a year after his appointment  and he was replaced by William Stimson. Stimson held the position from 1884 until the purchase of the property by the Government in 1902, and continued his service to the MLH after that date. The task of the manager was to oversee the running of the facility and so ensure that the rules were adhered to by the inmates. The rules provided that applicants would be admitted from 6 pm to 11 pm; that all the inmates must retire to rest by 11 pm and leave the dormitories at 8 am and while no smoking was permitted in the building, the men had the use of a smoking shed in the yard. 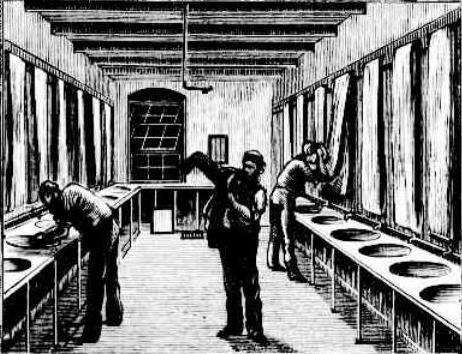 No meals were supplied, but the inmates were permitted the use of fuel and hot water, if they wish to do any cooking, or make a cup of tea or coffee for themselves and there were six shower-baths provided, and lavatories on each floor. To ensure perfect cleanliness, the bed linen was to be washed once a week, or oftener if required, and all clothing that was deemed unclean was to be passed through the purifying or fumigating room. While there were great expectations held for the MLH, it had obvious short comings as a solution to the problem of housing the poor. Firstly, it only provided for single men and did nothing to address the problem of accommodation for single women and secondly, it did not address the plight of the married with or without children. Furthermore, it was a facility that only could accommodate a small portion of those who would benefit from its services. But it was a start and an attempt to address the issue and it continued as a company providing accommodation until 1902 when it went into liquidation. In 1902, the Government resumed the property and was seeking £420 per annum rent if the MLHL committee wished to continue its operation so the committee decided to accept the Government’s offer to purchase the property. It did so, in part, because of the changing role of Government in the provision of social services where it was becoming much more involved and taking over the roles hitherto largely exercised by charitable organisations. Louis Phillips, the Chairman, warned the shareholders as they considered the future of the MLHL that “as the Government was taking in hand so many matters it was quite on the cards that it would, at no distant date, enter into competition with the company.” The shareholders, so advised, voted for liquidation and so ended this attempt at a self-supporting philanthropic work. Illustrated Sydney News and New South Wales Agriculturalist and Grazier (Sydney, NSW), November 23, 1872, 4. SMH, February 23, 1878, 11. From the few extant financial statements it does not appear to have ever paid a dividend. The Directors used the profits wisely concentrating on paying off the mortgage. SMH, June 20, 1882, 3. SMH, October 26, 1874, 4. B. G. Burton-Bradley, ‘Bradley, Henry Burton (1815–1894)’, Australian Dictionary of Biography, National Centre of Biography, Australian National University, http://adb.anu.edu.au/biography/bradley-henry-burton-3040/text4467, published first in hardcopy 1969, accessed online 8 August 2016. 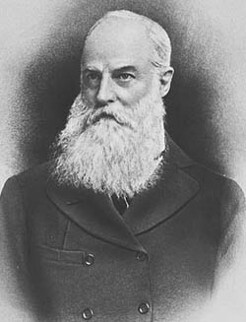 Josiah Mullens, (1826–1915). Jim Bain, ‘Mullens, Josiah (1826–1915)’, Australian Dictionary of Biography, National Centre of Biography, Australian National University, http://adb.anu.edu.au/biography/mullens-josiah-13120/text23741, published first in hardcopy 2005, accessed online 8 August 2016. SMH, March 9, 1877, 4. SMH, August 30, 1877, 5. Evening News (Sydney, NSW), February 18, 1878, 2. SMH, February 23, 1878, 5. He was a collector for the MLHL from 1877 to 1881.SMH, June 1, 1878, 11; May 17, 1881, 2. SMH, April 5, 1878, 4. SMH, August 16, 1878, 5. SMH, July 16, 1878, 7; September 14, 1878, 5. SMH, March 17, 1880, 11; August 27, 1881, 9. SMH, May 13, 1881. 2. Sidney was on a commission of 2.5% and in 1881 was paid £125. SMH, May 22, 1882, 3. SMH, May 23, 1882, 3. SMH, May 19, 1883, 20. SMH, April 29, 1884, 5; The Sydney Mail and New South Wales Advertiser (Sydney, NSW), May 24, 1902, 1293. Government Gazette of the State of New South Wales (Sydney, NSW), January 13, 1909, 5, 14. SMH, May 23, 1882, 4. Government Gazette of the State of New South Wales (Sydney, NSW), August 19, 1902, 498, 5886. The Sydney Mail and New South Wales Advertiser (Sydney, NSW), May 24, 1902, 1293. SMH, May 16, 1902, 8. By phinaucohi in Philanthropy on August 23, 2016 .